appeared to be responsible for substantial changes in the benthic fauna. Sediment loads normally limit the diversity and abundance of benthic algae in the Colorado River, but in the tailwaters below Glen Canyon Dam, transparency exceeds 7 m, and the filamentous green alga Cladophora glomerata is abundant. Although Cladophora enters the food web primarily as detritus, it provides epiphytic diatoms and habitat for invertebrates, including the amphipod Gammarus lacustris, and thus helps to sustain a blue-ribbon fishery for nonnative trout (Shannon et al. 1994, Blinn and Poff 2005). The benthic invertebrate community immediately below dams often shows a reduction in species richness. In the Gunnison River, Colorado, the greatest number of species of Trichop-tera (Hauer et al. 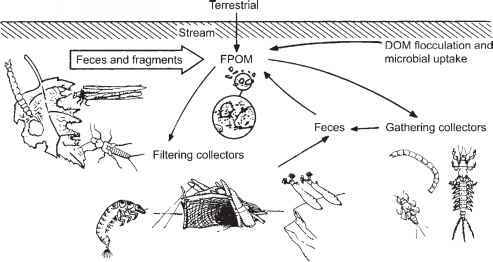 1989) and Plecoptera (Stanford and Ward 1989) are found in unregulated reaches, and the lowest species richness occurs in the tailwaters below deep-release dams. Often the faunal changes are fairly predictable from knowledge of habitat requirements. From a survey of the effects of dams on mayflies, Brittain and Saltveit (1989) report that low flows usually cause a shift from lotic to lentic species such as Cloeon, Paraleptophlebia, and Siphlonurus, whereas high flows and fast currents favor other species including Baetis, Rhithrogena, and Epeorus. modromous (migrating within river systems) Acipenser sinensis in the Yangtse River, fragmenting populations of the endemic Yangtse sturgeon (A. dabryanus) and contributing to the decline of the paddlefish Psephurus gladius (Dudgeon 2000). Many aquatic species that dwell in the streams of tropical islands migrate between rivers and coastal zones (March et al. 2003). Although some shrimp, fish, and snail species have impressive abilities to overcome obstacles such as waterfalls, large dams without spillways totally block migrations, causing the extirpation of species that may play important roles in headwaters (Pringle 1996). Experimental exclusion of freshwater shrimps from sections of headwater streams of Puerto Rico has shown effects on sediments, algal and insect assemblages, and on litter processing (Pringle et al. 1999, March et al. 2003), suggesting that the elimination of shrimp may have significant consequences. (Figure 13.4) and the obvious negative effects of dams, other factors including deteriorating habitat in nursery streams, commercial and recreational harvest, and varying ocean conditions all affect salmon survival (Ruckelshaus et al. 2002). Because it is uncertain how much salmon would recover by the removal of just one of these threats, and hydropower provides 90% of the energy needs of the Pacific Northwest, the breaching of Columbia and Snake River dams to restore salmon has failed to gain widespread support. In other instances where dams block access to extensive salmon spawning area and generate only modest hydropower, such as on the Elwha River in Washington State, advocates for dam breaching have met with greater success. Floodplains are a natural feature of large lowland rivers, a fact that is easy to forget in North America and Europe due to construction of dams, dikes, and levees to control flooding and permit agricultural use and human settlement in former floodplains. Natural floodplains are highly imperiled ecosystems, with over 90% under cultivation in Europe and North America (Tockner and Stanford 2002).